Second VSRA Win for CFTC! From left: Sharilyn Hale, Board Director & Chair of Nomination & Governance Committee; Debra Kerby, Executive Director; and David Pell, Vice Chair of the Board. CFTC recognized for second consecutive year for best practice in governance and financial transparency. Toronto, February 7, 2014—Canadian Feed The Children was awarded the 2013 Voluntary Sector Reporting Award of Excellence for Transparency in Financial Reporting in its category for a second consecutive year. In presenting the award, Rod Barr, President and CEO of the Chartered Professional Accountants of Ontario (CPAO), commended CFTC for its report’s “choices and voices” theme, best practice summary financial reports, and the inclusion of stakeholder conversations and statements of impact. 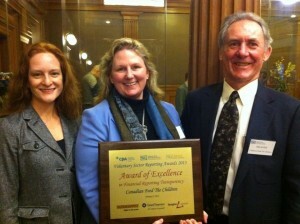 The prestigious award, established by Queen’s University Centre for Governance and the Chartered Professional Accountants of Ontario (CPAO), sponsored by accounting firm Grant Thornton, and endorsed by Imagine Canada, is in its sixth year recognizing best practice in financial reporting and governance in the charitable sector. This year, 130 entrants competed in five categories. View CFTC’s award-winning 2012 Annual Report here.